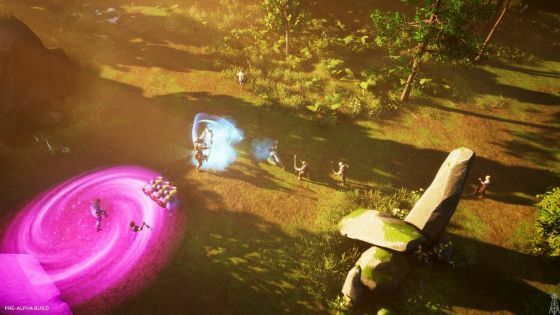 Farflame interviewed Sergio Prieto, CEO and narrative director of Gato Salvaje Studio, about The Waylanders, which is currently in its last days on Kickstarter. Sergio Prieto: Well, this is a logical concern, we have had many years of experience in video games, and the main thing we have learned is that you can't launch a project while having doubts, and I mean doubts about any aspect of your game: your gameplay, your script, your production pipeline... everything. And with this project we had a focus right from the start, to make sure that we are doing the right things all the time. We looked into having enough, and the best people possible, to create a game like this. We hired Mike Laidlaw and our other consultant, not only because of the script, but also to know if our production process is the best for this kind of game. Mike came here to our studio in Spain during two weeks and had interviews with all of our team, he saw our planning and raised warnings and concerns. Then he help us to build the High Level Narrative in order to make sure that we would have the game that we wanted. RPGWatch: I like that you use mythology and locations from your home region. But where did you get the idea for two time periods? I have no problem with that, it could be very interesting if done right, but most studios would probably create a pure Celtic RPG. Were you interested to see how the game world evolves over time or something? Sergio: I started to think about this game several years ago to use the Celtic and medieval eras, because our country has a lot of great legends located in those two periods. So I read a lot about the differences of the two time periods and when I was finished, I was totally surprised about the incredible social differences between these two moments in time. I realized that the most interesting thing would be to confront people with the contrast of those two periods. The reaction of our characters and how they adapt to the two worlds is something that I really think will be awesome to experience for any CRPG player, like myself. 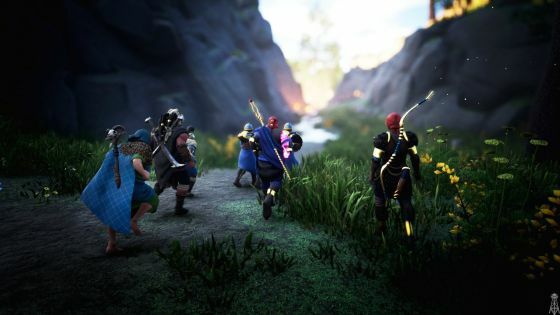 RPGWatch: Can you compare the Celtic world of The Waylanders to the usual fantasy worlds? It seems it wont be a 100% realistic Celtic setting, I'm OK with that, something new and authentic is a plus. So what are the main differences (compared to usual fantasy) or main strong points of your setting? Sergio: The first thing that all our writers told us is that our lore is really refreshing to them. 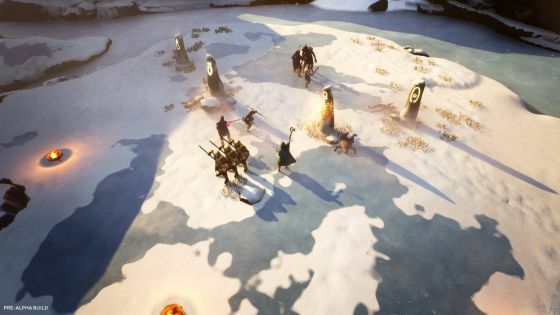 The Waylanders will be a fantasy game for sure, but the players could look at the characters, locations and legends and receive a lot of new information that they probably didn't know before playing our game. We are using Celtic mythology, like Fomorians or the Tuatha de Danaan but we are focusing on legends and monsters that were never told in a video game before, and I really want to see the people's reaction with the Mourians, or a location like Brigantia. RPGWatch: You have sorcerer and healer classes in the game and there will be some magic in Celtic times. But does it change somehow in the medieval period? Because it would seem strange if you could simply hire a sorcerer in a medieval city and cast spells on the street. So I wonder if there will be less magic in medieval times and/or if you could be punished if the wrong person sees you doing magic in that time period? "This age... it makes its bold claims of 'progress'. Where once nature and its flame was our ally, now they set it upon us. (Disgust at a burned witch by priests) What culture seeks to kill its own past..."
RPGWatch: Formations are an important part of your combat system. What can enemies do to counter them? I mean to not make formations overpowered? Can enemies use formations too or cooperate somehow? Sergio: Some enemies will have abilities that break formations, but the most interesting part will be when the enemies come with their own formations, which combined with the player's formation, will become a challenge. The formations will have a rock-paper-scissors mechanic and some formations will be better in countering the formation of an enemy than others. Obviously the biggest novelty in our game are the formations, but I really believe that the depth of our combat is in mixing these formations with the advanced classes. All of our gameplay is focused on letting you experiment and achieve incredibly powerful combos using all of the formations and the characters' abilities. Sergio: The enemies will have no respawn and there is no scaling, so you need to do as much missions as possible to scale up sufficiently for some parts of the game. The loot will be randomly placed, but the very special items will be hand placed, so they become a prize you can obtain in the very difficult or special missions. RPGWatch: It seems that gameplay is focused mainly on combat and dialogues. Are there some non-combat skills, non-combat activities, some puzzles etc.? Sergio: Yes we'll have environment puzzles for the characters and formations. Sometimes as part of the main mission but sometimes also to avoid combat or to reach hidden areas. Probably we could consider romance to be a non-combat mechanic as well, but there will be also ways to build your characters outside of combat. RPGWatch: You have 4 experienced writers/collaborators - Mike Laidlaw, Emily Grace Buck, Josué Monchan and one unknown individual. BTW this unknown person is probably Chris Avellone because he is in everything nowadays. :-) But enough jokes, back to the questions. Can you tell us a little about duties of these collaborators? Are they interested in some fields or do they basically work on everything? Was the basic story of The Waylanders done before you got them on board? Sergio: As I told in the first question at the very beginning they helped us with the production pipeline. During the script creation, Mike and our other collaborator were working hard on the high level narrative; Josue and I were working more on the little things like abilities, descriptions in the inventory and things like that. When we reached the end of the high level narrative we thought about needing another person to work on the close encounters, and that's the moment we contacted Emily. The experience she brings is incredible. But even with the work was split up like this, we are all reading and giving feedback. Right now, for example, Emily is giving incredibly valuable input to the high level narrative. About the story that we had before the came on board: I had the villain, the motivations, the beginning, the end and the main character detached from the time line, with all its magic-religion confrontation that I told you about. But they totally helped to build that and made it into something very, very solid. RPGWatch: Usually, the challenge for RPG developers is to make quests interesting, avoiding too many generic kill/fedex quests. How do you cope with this challenge? Are there some basic design principles you try to adhere to? Sergio: Totally, one of the main things we told our self at the beginning was that we want to have a lot of character missions that depend on your relationship with the companions, very similar to the loyalty missions of Mass Effect. You will have a loyalty mission with all your companions, but if you get a closer relationship with them, you will receive more missions and they'll become more important. We want to have the characters at the core of our game in many point of views. RPGWatch: Given the fact you have some non-human mythological races, I wonder if you would like to alter dialogues somehow to reflect that? I mean like using some words from their language to add flavor to the text or something? Sergio: All the races have their own symbols; you'll have different lines depending on your origin, but not only because of your race. Even if you create a human, you can be a Greek mercenary (for example) and that will be different compared to being a Celtic sorcerer. As far as having a reference in the game goes, for the Greeks the tower in Brigantia will be "The Heracles' Tower" but for the Celtics it will be "The Breoghan's tower" and they'll have discussions about the different legends and what the correct name is. RPGWatch: There is/was some debate about writing in RPGs. So I would like to ask if you prefer pretty short replies (text) when writing dialogues (to tell a "maximum with a few words") or more abundant "old-school style" with more paragraph(s) of text? Sergio: I think that we'll be a bit in the middle. I love the old school but we'll have a lot of lines to record so we'll need to be a bit pragmatic at times. Probably in the lore, the books and all that, which don't need audio recording, we'll have a large amount of text to get deeper into that we are showing. Sergio: Oh yes, I think right now there is an audience that is big enough for developers to have different approaches to RPGs. I'm sure that indie developers will have the opportunity to grow, showing different and exciting proposals. As you say at the beginning, it is difficult to trust new studios, but at the same time I'm feeling that we have the duty to present new and unknown proposals to the genre, because it's the way to find our own identity and to find the players that want this new stuff from us. RPGWatch: If you would have a big budget, what game would you like to do (after The Waylanders)? 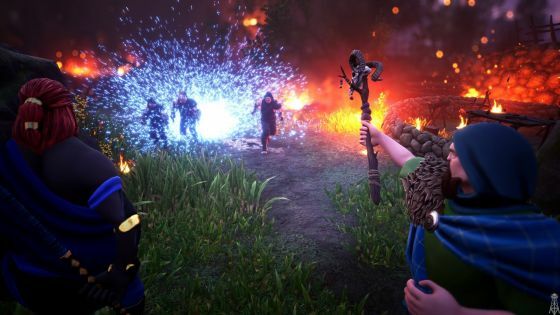 Sergio: Well, I have a great project in mind after The Waylanders, but the reality is that The Waylanders is the game that we always dreamt about. We do not just create a game, it's our culture and our legacy, and we want to share it with all the players around the world. Right now it is the game that has all our emotions and efforts in it for the last 8 years, so we are incredibly excited and focused on it.